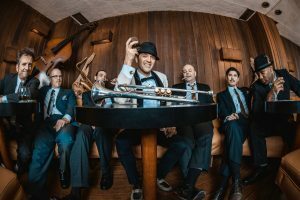 Cherry Poppin’ Daddies in the name of Swing. 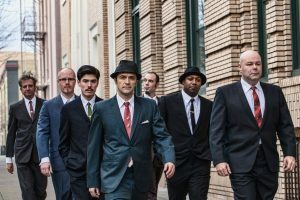 The Cherry Poppin’ Daddies burst onto the music scene 20 years ago with the release of Zoot Suit Riot a compilation of their Swing songs with four newly recorded songs(including the title track.) The album would go on to sell over 2 Million copies. On the tail of the 20th Anniversary and a remastered reissue of ZSR the Daddies will be performing at the Gallo Center for the Arts on February 9th, 2018(Tickets are on Sale Now.) 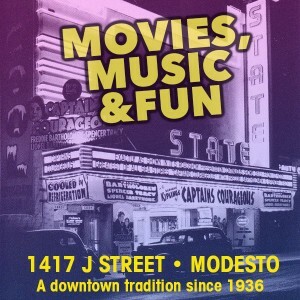 This is a return to downtown Modesto for the band who performed at Fat Cat August of 2009. Get tickets at the Gallo Box Office or at online. We talked about touring, bands from Zappa to the Kinks, Specials to Mr Bungle and Skankin’ Pickle and so much more. Read some of our conversation below. MV-Steve it is great to talk to you once again. SP-Doing well, heading into the studio hope you can hear me well. MV-Yeah I can hear you. So you are back in the studio, that is great. Are you working on an album of new original material? SP-Yeah we have 10 tracks done and working on 3 more. Much more SKA tinged, powerful sounding songs. Heavy guitars, in the vein of Irish Whisky or Hi and Lo, I actually originally wrote that for Dickey and the Bosstones. We are all really excited for this album. I would love to connect with old friends like the Bosstones, Reel Big Fish, Less Than Jake after this album comes out. Would love to do some dates where we play more of our SKA stuff. Not sure how we would market that but we would love to do that. MV-Cool, kind of like when Fishbone did the “All SKA Review.” of course they played the singles off of Reality of My Surrounding, but the rest was all SKA from the early years. SP-Yeah something like that we would still play Zoot Suit Riot I am sure but would be fun to bring back some of the older songs and play stuff off the new album we are working on. In 2009 we released a compilation of all our SKA songs called SKAboy JFK. Much like Zoot Suit Riot compiled our Swing songs and 4 newly recorded tracks. MV-Well I for one will be looking forward to that. Speaking of looking forward, what can we expect at the Gallo Center for the Arts show in February? SP-When we play the bigger Halls, Theatres and Wineries and the likes we play our Swing songs. We have re-released Zoot Suit Riot, I went in and remastered it and am happy with the way it came out. We licensed that album to Mojo and recently the rights reverted back to us. We will most likely throw in a couple SKA songs or Rockers. Though overall for these types of shows we play our Swing Songs. We are happy to play all those songs, we wrote them and are happy people want to still hear them 20 years later. We were not a swing rivival band, we were trying to build on the foundations of American music. We mixed in Swing, Rockabilly, Psychobilly(Ok that is English), Funk and SKA. When we started a lot of bands were mixing things in a lot more. Unlike Mr Bungle who would throw 6 different genres into one song, the Daddies wrote 6 songs that each explored a different genre. Lyrically the album would tell a story giving each song continuity. MV-I need to ask you this question, Beatles or the Stones? SP-I have to say the Rolling Stones. Don’t get me wrong I love the Beatles they are the greatest Pop Band. The Stones knew how to Rock. They wanted to be a Blues band but as most the English bands at the time they didn’t quite get. MV-I know you are a big fan of American Music, Rockabilly, etc. What do you know of the Maddox Brothers and Rose? SP-I am not really familiar with them. MV-Considered one of the foundations or Rockabilly and Rock and Roll. Started in 1938 here in Modesto. Don the fiddle player, actually lives up near you now. They were advertised as the most colorful Hillbilly band. Fred is credited with developing the Slap Bass style which is so key to early Rock. Legend also goes that Elvis performed with them early on in his career and said he would have a suit like theirs. SP-Is Modesto close to Bakersfield? MV-About 200 miles, the Modesto Area then and still is heavily agricultural. So in the dustbowl era, many migrants workers ended up in the Modesto area. SP-I will have to check them out? MV-Check out Roddy Jackson and the Merced Blue Notes. I think you will enjoy what you hear. MV-Thanks for your time and let’s talk closer to your show in February. Once again I can not wait to hear the new songs and to see you all play live again. Say hello to Dan and Dana for me. SP-Yes, you have my contact and I will send you the new record when we are finished. Maybe you can suggest some people I should send it too. Thanks again and see you in Modesto.